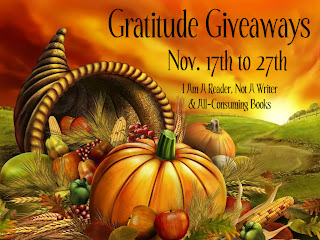 Michelle Madow: Gratitude Giveaway Hop! For my giveaway, I want to say a huge thank you to everyone who has been so enthusiastic for my debut novel, Remembrance. Everything you do -- from following my blog, twitter, liking my Facebook page, and entering my contests -- is so helpful with spreading the word about my book! I'm giving away a copy of Remembrance, and this giveaway is international (as long as the Book Depository ships to your country.) All you have to do to enter is follow my blog via Google Friend Connect. I would love it if you added Remembrance to your Goodreads to-read list! Thank you for entering the giveaway, and good luck! I already won last time so I won't enter again but I wanted to say thanks again! The cover looks great! I hope to start reading it next week! Thanks for the Giveaway, Michelle! Thank you SO much for hosting this international giveaway! I can't find this book anywhere! Thanks so much for the chance to win Remembrance! Great giveaway! For another giveaway idea, I'd love to win one of those masks like the ones that's on your covers, they are simply gorgeous!! Thanks for hosting this hop giveaway. Would love to win your book. I love the masks on your covers. They are beautiful and mysterious. Thanks you very much the giveaway! New GFC follower here. Thanks for the awesome giveaway. If you get a chance, come on by and stop by my blog. I'd love for us to become great friends!